Enter Chip's Family Restaurant on many Monday nights, and the restaurant will be full of diners, enjoying soup or burgers or any of the many varieties of Chip's pancakes. But when they pay the bill, all of the money will go to a local charity, and not to the restaurant's owners. On designated nights, George Chatzopoulos and his sister Dina Chatzopoulos Bajko, donate 100 percent of the revenue they take in to various charities in their local communities. (Chip's restaurants are in Fairfield, Trumbull and Orange.) They don't take the cost of the food they prepare out of the proceeds, and they hold at least one fundraiser every month. "For us it's an opportunity to give back to the community -- to give back to this country," said George Chatzopoulos, who emigrated here with his family from Greece in 1989. When the family arrived, they didn't have much, he explained. They are grateful for what the U. S. and their local communities have done for them, and they want to give back. "We've been very fortunate," he said. The brother and sister were honored recently on the floor of the state House of Representatives where they received an official state citation. "The Chatzopoulos make everyone in Fairfield feel like part of their family," state Rep Brenda Kupchick said when the award was made. The Chatzopoulos family is partial to raising funds for schools and their athletic teams, as well as high school theater groups and other school activities. But they also help support the Fairfield Rotary Club, Operation Hope in Fairfield, the Fairfield firefighters and the Burn Center at Bridgeport Hospital, among other charities. And at their three restaurants, they fundraise for different charities in each community. "We like to do this with local charities," said Dina Chatzopoulos Bajko. "We want to make sure it goes to who they say it goes to." On March, 24 the Fairfield restaurant raised money for McKinley Elementary School. The side of the restaurant used for fundraisers was packed by 6 p.m. that night and there was a line going out the door of McKinley families waiting for tables. The McKinley PTA has been raising funds at Chip's for several years, usually raising about $1,200 in one evening, according to Jill Kellerman, president of the McKinley School PTA. The money is used for the school's field trips, author visits, teacher's grants and cultural arts programs, she said. "He donates 100 percent -- everything goes to us," the PTA president said. The Chatzopoulos family's biggest annual fundraiser is on Thanksgiving morning when they serve a meal in all three of their restaurants for $12 per person. Last year they raised a total of $25,000 in all three diners. In Fairfield, 100 percent of the funds they raised that morning in Fairfield went to the Operation Hope agency to help support the homeless. "Why do a fundraiser where at the end of the day, you get just $100? Why bother?" George said. "I want to make it happen." His sister said that she and her brother were raised in a family that believes in giving to others, and to work as a team. Now, Dina's husband Adam helps run the three family restaurants, and to hold the frequent fundraisers they have become known for. The Chatzopoulos family has been in the business since 2003 when they opened their first Chip's Family Restaurant in Orange. The Fairfield Chip's, 525 Tunxis Hill Cutoff, is the newest, opening in 2011. A fourth Chip's Family Restaurant will open this fall in Wethersfield. In addition to opening new restaurants, Chip's is also offering new healthier selections on their menu, the brother and sister added. Their new menu will offer some items that are hormone, antibiotic and gluten free, in addition to their current fare, Dina said. 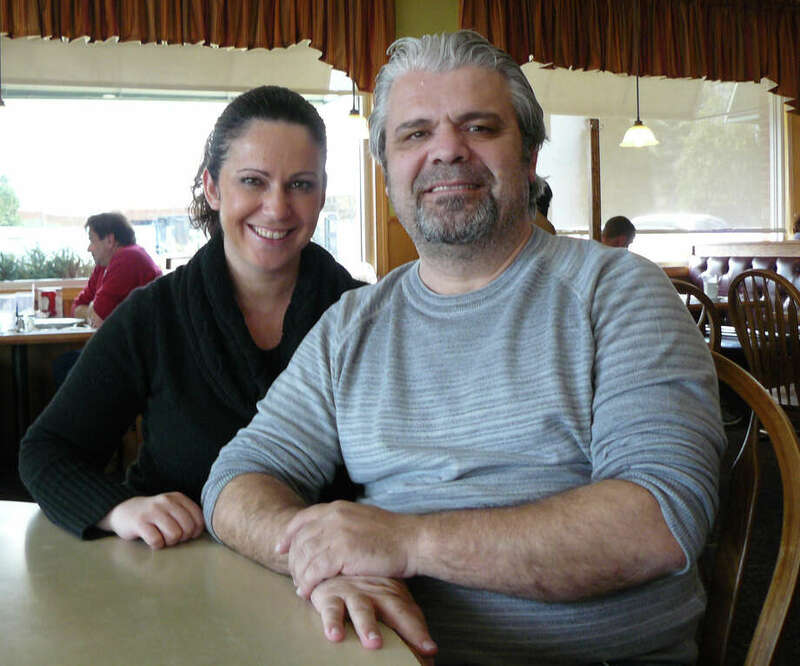 The Chatzopoulos siblings hope the new menu will keep their loyal customers coming for both the new and traditional items on the Chip's menu. But the real reason the restaurants -- and all their fundraisers -- are so successful is because of their customers and not because of them, or anything they do, George said. "The reason is, we have such wonderful customers, they become part of our family," he said.